Justinian I, 527-565 A.D., bronze follis. Exceptional portrait and great preservation. Obverse: DN IVSTINIANVS PP AVG ("Our Lord, Justinian, Father of his Country, Augustus"). Helmeted and cuirassed bust facing, holding globus cruciger and shield; cross to right. Reverse: Large M between ANNO and regnal year XV (15; 541/42 A.D.). 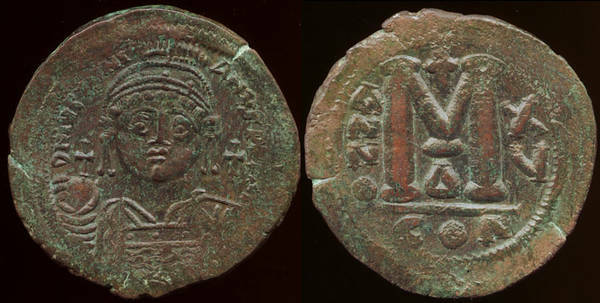 David Cervin, author of the wonderful article on Regnally Dated Byzantine coins (see below to obtain it), believes that these large folles were issued to commemorate the completion of the the famous cathedral of Hagia Sophia in 537 A.D. That, combined with the the codification of "Justinian's Law", were the primary reasons for his greatness and the commemoration of his reign. These folles were the largest of ancient coins; regnally dating them tracked his rule.